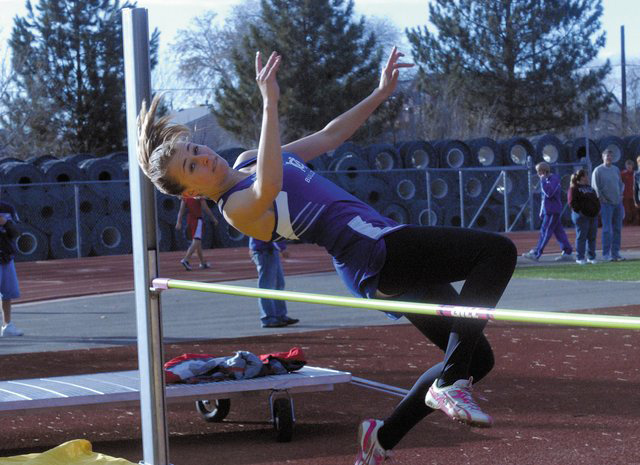 Lauren Roberts, a 2011 Moffat County High School graduate, clears the high jump bar during a track meet during her junior year at MCHS. Roberts competed in the heptathlon for a year at the University of Colorado-Colorado Springs and is now transferring to the University of North Carolina at Chapel Hill to run, jump and throw there. — Each athlete is awarded a point value based on their performance in each event. Points are not based on place of finish, just individual performance. The athlete with the highest combined score at the end of seven events wins. 2011 Moffat County High School graduate Lauren Roberts is getting used to change. The track and field standout showed off her athleticism by competing in a variety of events while at MCHS—long jump, high jump, triple jump and the 200-meter dash. But those events require mostly similar skills; speed, explosiveness and power. When Roberts was recruited by the University of Colorado-Colorado Springs, it was to compete in the pentathlon and heptathlon—competitions that consist of several events, most of which differ from what she had been doing before. “I didn’t do any triple-jumping last year and only ran a few 200s. In doing heptathlons, I picked up a bunch of new skills,” she said. Three of Roberts’ former events are in the heptathlon—long jump, high jump and the 200. But Roberts also had to learn the 100-meter hurdles, shot put, javelin throw and 800-meter run. Learning four more very different events was a challenge for Roberts, but she said in some cases it was also something she was looking forward to. Roberts picked up her new competition quickly and had a successful freshman season at UCCS, finishing third in the heptathlon at the Rocky Mountain Athletic Conference Championships. After the track season ended, however, UCCS went through some serious changes. The Air Force Academy was the site of UCCS team practices during the winter, but the AFA decided it didn’t want the Mountain Lions there anymore. The loss of a training facility, coupled with the departure two coaches mostly focused on field events, prompted UCCS to eliminate technical events from its program. Next year, the Mountain Lions track team will only consist of runners. That left Roberts with a choice: stay on scholarship but no longer be a heptathlete at UCCS or look into transferring. Roberts said it was not a difficult decision. In looking for schools to transfer, it came down to Colorado State University and the University of North Carolina at Chapel Hill. She had been to North Carolina before, both as an athlete at the Raleigh Relays and as a visitor (her boyfriend is stationed in Fort Bragg). Having enjoyed the East Coast, Roberts said she decided to look further into UNC. She fell in love with the school and the area and decided attending UNC would be her goal. There were still question marks, though. Roberts said she got a hold of UNC’s track coach and was told if she wanted to run for them, they would gladly take her. She will be competing in the heptathlon as a Tar Hell and has a full tuition scholarship to the university.